The idea of posting makeup-free selfies is nothing new. Celebrities like Beyoncé, Rihanna and Lady Gaga have been doing it for years. But after Cancer Research UK started the #NoMakeupSelfie campaign last month, the idea took on a whole new meaning. Loads of women around the UK – famous and not – shared their fresh-faced selfies and helped raise more than £8 million for cancer research. We saw a huge variety of pictures, but this late entry from a pair of great-grans is our absolute favourite. 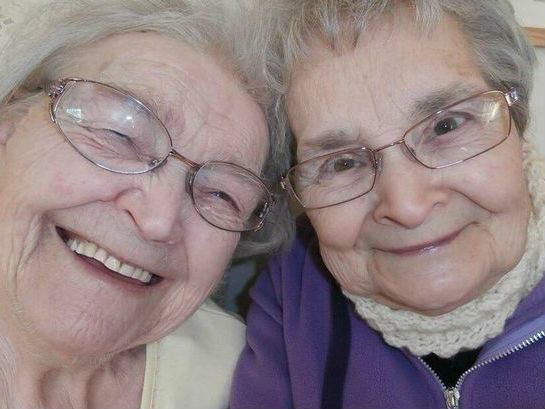 Sisters May Race, 93, and Brenda Page, 81, have become the oldest Brits to tweet their selfie for charity. They posted this smiling snap and each donated £5 to Cancer Research UK. ‘We’d never heard of a selfie before but it was all a lot of fun. I have certainly never taken one before. We’re not well up with those things, you see,’ Brenda told the Mirror. We’ll take this over another celebrity selfie any day.